We have read tons of stories and points of views about the potential deal between Microsoft and Yahoo over the past weeks. We guess all people did. Everything seems already being said about the deal. Yet, something interesting popped up in the news today. It turns out that Microsoft is the big loser from the situation with Yahoo’s acquisition because it has lost 13% of its market capitalization since it has announced its bid to buy Yahoo almost a month ago. 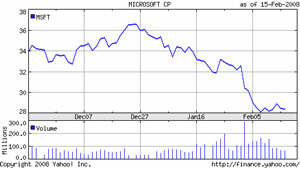 After Microsoft’s stock has fallen 13% since its offer for Yahoo, the Microsoft’s offer price seems to have also been reduced to $29 – $41.7B as of today. Yahoo shares, by contrast, closed at $29.66 on the NASDAQ on Friday, indicating that investors’ expectations are for Microsoft to raise its bid. While the software giant’s founder and chairman has taken a back seat to CEO Steve Ballmer in the Yahoo bid, Gates wasted no time in tempering expectations if Microsoft failed in its effort to buy Yahoo. “There is nothing new in terms of the process. We’ve sent our letter and we’ve reinforced that we consider that it’s a very fair offer,” said Gates, who remains the public face of Microsoft, even though he plans to switch to a part-time role at the company in June to focus on his philanthropic work. What will happen with the stock prices of both companies if a deal does not go thru? We think both companies will get punished by the public market and have their stock prices reduced. Yahoo’s hit is expected to be stronger.